In nature a seed might fall on the ground or get buried in mud or by an animal. When a gardener plants a seed, that person can point the seed any direction. Let’s find out if there is a best way to plant a pumpkin seed. Question: Does it matter which end of a seed points down? Step 1: Open your Science Journal, write “Investigation 4” and the date. Step 2: Cut a strip of cardboard 1.5cm shorter than the glass or the jar shoulder and 2.5cm longer than the circumference of the glass or jar. Step 3: Roll up the cardboard strip and slip it into the glass or jar to make sure it fits. When you let it go, the cardboard should unroll against the glass. You may have to push it out a little. Take the cardboard out again. Step 4: Fold the paper towel so it fits around the outside of the cardboard ring. Step 5: Roll the cardboard and paper towel up and put them into the glass or jar so the paper towel touches the glass. It must be very tight. You may need to fasten the cardboard ring with a paperclip to keep it tight. The cardboard holds the pumpkin seeds firmly against the glass. The paper towels will pull water up to the seeds. Each seed points a different direction. Step 6: Carefully slide the pumpkin seeds about half way down between the paper towel and glass so two point in each different direction, up, down and sideways. This can take patience and maybe a thin knife to push the seeds around. The seeds must be at least 3cm from the top and 3cm from the bottom. Step 7: Pour 2cm water into the glass and set it aside. The water will soak up into the paper towel. Make sure about 1.5 – 2cm of water is left in the jar. You may have to add some water to do this. Cover the glass with plastic wrap or put the lid loosely on the jar and set it aside. Step 8: Check the seeds everyday until they germinate and start to grow. Draw them in your Journal. Step 9: After the radicle comes out, watch for the cotyledons. Draw them in your Journal. Seed 1: Which direction does it point? How many days until it germinates? What does the root do? What does the cotyledon do? Seed 2: Which direction does it point? Radicles start growing down as soon as a pumpkin seed germinates. Seed 3: Which direction does it point? Seed 4: Which direction does it point? Seed 5: Which direction does it point? Seed 6: Which direction does it point? What happens to the radicle [baby root] when it starts to grow? Why is it important for the radicle to do this? What do you think causes the radicle to do this? A pumpkin sprout comes out of the little flat space at one end of a seed. What happens to the sprout when it starts to grow? Why is it important for the sprout to do this? What do you think causes the sprout to do this? A radicle must grow around to go down when a pumpkin seed points up. A radicle grows straight down when the seed point down. Which is the best way to plant a pumpkin seed? This entry was posted in Outside Project and tagged cotyledon, germination, pumpkin seed, radicle, sprout on May 13, 2015 by [email protected]. A seed is much smaller and looks a lot different than the plant it came from. The parts of a seed must change for the seed to become a plant. Let’s take a look at some of those changes. Question: How does a seed change as it germinates [sprouts]? Step 1: Open your Science Journal, write “Investigation 3” and the date. Draw Table 1 in your journal. Step 2: Label the outside of the custard cup ‘1’ and ‘2’ on opposite sides. Step 2: Put a double layer piece of paper towel in the bottom of the custard cup. Step 3: Add enough water to make the towel wet but not soggy. Step 4: Measure the length, width and fatness of the 2 seeds in millimeters. You can use the same method you used in Investigations 1 and 2. Write the measurements in for Day 0. After measuring the length, width and fatness of the pumpkin seeds, put them on the moist paper towel in the custard cup. Step 5: Put Seed 1 on the side labeled 1 and Seed 2 on the side labeled 2 on the wet paper towel. Step 6: Cover the top of the custard cup with plastic wrap. You may need to use a rubber band to keep the plastic wrap on. Step 7: Measure the 2 seeds every day until they start to grow. Be sure the paper towel stays moist. These pumpkin seeds germinated quickly in warm weather. The length, width and fatness all changed. Step 1: Get a piece of graph paper. Label the x-axis (horizontal) 0 to 7 for the days. Step 3: Use different colors for each seed and mark the measurements for each seed for each day. This means each seed has three marks, for height, for width and for fatness. Why does the seed swell up? Does the seed keep swelling the entire time? Why do you think it does this? Do the height, width and fatness all change? Why do you think this is true? How is the seed edge different where the radicle comes out? Why do you think the root comes out first? This entry was posted in Outside Project and tagged germination, pumpkin seed on April 29, 2015 by [email protected]. Plants aren’t interesting. They’re dull. They don’t move. Once you’ve seen a leaf, a stem, a root and a flower, you’ve seen all there is to a plant. Say that to the hundreds of people worldwide who grow giant pumpkins and they know you’ve never really taken a look at plants. Botanists (scientists who study plants) have studied plants for hundreds of years and are still finding out new things about them. This is your chance to find out a little bit of what all these people find so exciting. Why pick pumpkins? There are lots of reasons. One is that the big seeds are easy to work with. Another is that pumpkin seeds are easy to find and grow. Still another is the huge number of different kinds of pumpkins. And pumpkins are important commercial crops. They are eaten by people all over the world. They are grown on every continent except Antarctica. Tiny pumpkins take only a little space to grow and will even grow in a pot. They make nice Halloween decorations. Pumpkins are fun to grow. They can be used to make art. There are competitions for the largest pumpkins at county and state fairs. Then there are the competitions to grow giant pumpkins in North America, Europe and Australia. A newer competition for throwing pumpkins is starting around the United States. When should you start investigating pumpkins? Some of the investigations use pumpkin plants. Since these grow best in warm weather, spring and summer may be the best time. But many of the investigations take a week or two to complete because seeds take time to germinate and grow. The best time to start learning about pumpkins and plants is now. Then you will be ready to grow your best pumpkins ever in Project 1. It should be easy to guess what the first big Project is in a book about pumpkins. Project 1 is growing a pumpkin! Before you race to the store and buy some pumpkin seeds to grow, let’s make plans. What Kind of Pumpkin Should You Grow? By this time you have noticed there are lots of kinds of pumpkins. Some are very small. Others are extremely large. They come in different colors. Some have warts. Some have strange things on them. Before you decide on the kind of pumpkin you must decide where your pumpkin will grow. The space needed is listed as square like 10 feet by 10 feet but it can be longer and narrower as 5 feet by 20 feet, just have that much room. The place must get at least half a day of sunlight. Weighing five to seven pounds pie pumpkins are grown for eating. They are usually sweeter than larger pumpkins. Small pumpkins need only a little space, even a big pot will do. They can grow on a trellis. If you have only a little place for your pumpkin plant, you should grow a little pumpkin. Sugar pie pumpkins are a little bigger. These seven to ten pound pumpkins are the best kinds for eating. They need a space about ten feet square. They can grow on a trellis but you will have to support the pumpkins. The pumpkins may not get as big as they normally would because they will not get as much food. Halloween sizes of pumpkins get ten to twenty-five pounds. These pumpkins can be eaten too. They are not as sweet as pie kinds and are stringier. These plants need a place twenty feet square. Really big pumpkins need lots of room. Giant pumpkin plants need a place at least forty feet square. These plants need special care every day. They need lots of fertilizer and water. But growing one of these really big pumpkins is exciting. Stores have lots of these pumpkins in October. This is a Halloween type pumpkin. What Kind of Pumpkin Will You Grow? Once you know how much room your pumpkin plant will have, you can pick a kind to grow. Mini pumpkins come in orange, white and two colors. Pie pumpkins come in colors too but it is hard to tell when a white pumpkin is really ripe. Bigger pumpkins have even more choices. Pick out your favorite pumpkin of that size. That is the one you will grow. Serious pumpkin growers start the year before. They add manure to the place their pumpkin plants will grow. They kill off the weeds. We are starting in the spring so we have to hurry to get ready. You need to till or spade up your pumpkin area. Add compost and mix it into the soil. If the spot is covered with grass or weeds, you need to get rid of them. It takes more work but is better for your pumpkin plants if you mulch or till or pull those pesky weeds and grass. Herbicides do kill weeds but can kill lots of other things too including your pumpkin plants. This giant pumpkin weighed 878.5 pounds! Giant pumpkins are so heavy they flatten in shape. Even a little frost will kill a pumpkin plant. Small, sugar pie and Halloween pumpkin kinds can be planted in the garden after spring really arrives. Giant pumpkins can be planted then too but many growers start them in the house before then. While we wait, we’ll find out more about pumpkins. This entry was posted in Outside Project and tagged pumpkins, science on April 8, 2015 by [email protected]. School has started in my town. Summer still heats up the days but the days are shorter. It is time for the Outside Project to close for the winter. There were several other things I wish we had time to do. Perhaps we can do them another summer. For our last Outside Project we can make a keepsake bookmark to remind you of your tree and spot even while you are busy in school. You will need some clear plastic shelf paper and leaves from your tree. How Big Is a Bookmark? Why does this matter? If your tree has very big leaves like a sycamore, one leaf may be too big unless you want a very big bookmark. Even my redbud tree has leaves larger than the bookmark I want to make so I found some little leaves just coming out on another redbud tree. You can cut a leaf in half and use half of it. With a sycamore or maple leaf, you can make a design with the different lobes. Bookmarks do come in many sizes. Think about how big the books you like to read are. You will want your bookmark to fit into this size of book. Arrange your leaves the way you want them on the piece of paper. Cut out a piece of paper the size of the bookmark you want to make. Now make a rim around the bookmark pattern a quarter inch inside the edge of the paper. This rim is needed to seal the edges of your bookmark and will have no leaf or other bits in it. You can cut this rim off like I did or leave it on and remember to put nothing in it. Gather some leaves from your tree. If the leaves are small, you may want half a dozen. 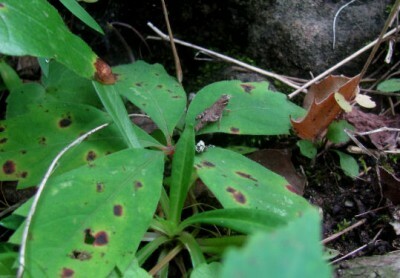 Young leaves are smaller than older leaves. Lay your leaves out on the piece of paper. Move them around until you like the design. Draw around your leaves to make a pattern on the piece of paper. Use a pencil and make a light outline of where the leaves will go. You may want to use a piece of colored paper behind your leaves. Cut a piece the size of your bookmark and arrange the leaves on it. Make the leaf outlines on this paper. Perhaps you want to add sparkles. Have any fancy bits ready for when we make the bookmark. Cut out two pieces of clear shelf paper making each side half an inch bigger than your bookmark pattern. Under the backing on the shelf paper is a glued surface. Once something is put on this glue, it can’t be moved. Make sure you know how everything is arranged and mark this on the piece of paper. Take the backing off the piece of shelf paper and lay it glue side up over your pattern. Remove the backing from one piece of shelf paper. Lay the shelf paper piece with the glue side up over the piece of paper. If you are using a piece of colored paper in the bookmark, lay it on the glue side of the shelf paper leaving the half inch margin around it. Place your leaves down where you want them using the outlines as a guide. If you are putting the leaves directly on the glue, press them down firmly. You want the entire leaf on the glue without air pockets. Add any sparkles or other fancy shapes to your bookmark. If these are larger, press them down firmly like you did your leaf. Make sure you have everything arranged for your bookmark. Place the leaves on the plastic over your marked pattern and smooth them down. Remove the backing from the other piece of shelf paper. Now comes the hardest part. You will attach the glue side of the second piece over the other piece so the two glue sides glue themselves together. Start with the upper edge with most of the second piece curled over your hand. Press the two edges together firmly. Little by little press more of the second piece down onto the first piece. Smooth each new layer down firmly trying to keep all the air bubbles pushed out. Take your time doing this. Hurrying will make the pieces go together too quickly so you can’t press them firmly without moving things in your bookmark. When the second piece is completely pressed down onto the bookmark, press it down one more time to make sure all of the two pieces are firmly glued together. Carefully smooth the second piece of shelf paper over the first so the two glued sides are together holding your leaves in place. Be sure you leave a quarter of an inch of clear edge around your bookmark. This holds the bookmark together. It keeps air from getting inside the bookmark and drying out your leaf. Your keepsake bookmark will last a long time. When the leaves turn colors in the fall, you can make another bookmark with the prettiest leaves from your tree. Make sure the leaves are not dried out when you make the bookmark or they will break up inside the plastic covers. I have a bookmark I made with a four leaf clover many, many years ago. It is still nice but the leaf is turning brown. This four leaf clover bookmark is over ten years old and still usable. Just because summer is over doesn’t mean you have to stop visiting your spot. As fall arrives the plants will turn colors. New creatures will visit. You can hear different birds as migrants fly south. Pick out a book to read and put your new bookmark to work. For me the best part of having my spot is a time to sit quietly enjoying hearing the wind ruffle the trees. It’s a time for me to relax. That is true any time of the year even if I need to wear a heavy coat. This entry was posted in Outside Project on August 20, 2014 by [email protected]. Outside 6 How Tall Is Your Tree? Missouri Trees, the Missouri Department of Conservation guide to trees, gives height ranges for the different trees. The Department has a list of champion trees with their heights. There must be a way to measure how tall a tree is. A short tree is easy to measure. Use a tape measure held at the bottom and read the inches at the top of the tree. A tall tree is not so easy. It might be possible to climb the tree carrying a rope or long measuring tape with you. Those top branches might not be sturdy enough to hold you. Maybe, like me, you are not a very good tree climber. There must be a better way to measure the height of a tree. In fact, there are two methods. Method 1 will not work for my tree so I picked out the tall straight tree by a pasture. The first method only works for a tree out in the open so its shadow is easy to see. If your tree is like that, you will need a rod three or four feet tall, a way to pound the rod into the ground and a measuring tape or stick. My tree is in the middle of lots of other trees so I couldn’t use this method. Instead I chose a tree by a pasture to show how this method works. Watch your tree’s shadow. When is it long and easy to see? This is the time you to measure your tree. The rod was 41.5 inches with a shadow of 34 inches. Go out early on a sunny day. Pound the rod into the ground so the sun shines on it to make a shadow. Measure how tall the rod is. When the right time arrives, quickly measure the length of the rod’s shadow. Then measure the length of your tree’s shadow. Write all your measurements down. Change all of them into inches. The tree’s shadow reached 799 inches into the pasture. My measurements were 41.5 inches height of the rod, 34 inches length of its shadow and 799 inches the length of the tree’s shadow. This calculation is simple algebra. Don’t give up if you don’t know any algebra. This is easy to learn. First you need to know this axiom: What you do on one side of an equation (a math sentence) must be done on the other side so they stay equal. Stop and think. Write the equation 3 = 3. I hope you agree that three does equal three. Now, if you multiply one of those threes by two and want the equation to stay true, you must multiply the other side by two as well. This is written as: 3 x 2 = 3 x 2 or 6 = 6. Second you will do a simple proportion. You know the height of the rod, the length of the rod’s shadow and the length of your tree’s shadow. You want to know your tree’s height so this is not known. Pick a letter to take its place for now. The height of my rod is to the length of its shadow as the height of the tree is to the length of its shadow. Now comes the part the axiom tells us about. Multiply both fractions by the length of the tree’s shadow. For me that is 799”. My equation now looks like: (799”)(41.5”/34”) = (799”)x/799”. Since a number over itself is another way to write one, the two lengths of the tree shadow become one and the letter is alone. Do the calculation with the numbers. For the tree I used the answer is 975” or 81 ft tall. This method needs a special tool that is easy to make. You need a protractor, a straw, a piece of string, a paperclip and some tape. A large protractor is easier to read the angles on. Fold the string over the flat part of the protractor in the middle. Tape the string to the protractor. Tie the paperclip on the other end of the string. Tip the protractor to make sure the string moves easily over the angles on the protractor. You can make a clinometer with a protractor, straw, string and paper clips. Tape the straw across the flat part of the protractor. Don’t tape over the string, just in front of and behind the string. This tool is called a clinometer. It’s like the sextant used by surveyors and sailors. It is used to measure angles. Take your clinometer, a yard stick and your journal out to your spot. A friend is helpful doing the measuring. Standing a little ways away from your tree, look through the straw to the top of your tree. Put a finger on the string to keep it on the protractor angle when you put the clinometer down. What is the angle? The clinometer shows an angle of 55 degrees to the top of my tree. This method works the best if the angle is between 40 and 70. If your angle is less than 40, try to move a little closer to your tree. If your angle is more than 70, try to move farther away. Once you have your angle, write it down. You held the clinometer at your eye level. How far is that above the ground? If you have a friend helping you, have your friend stand by your tree and put a hand on the trunk. Use the clinometer to find out when the angle is 90 degrees. Your friend may have to raise or lower the hand to get it right. Measure how high the hand is. Write this down. Now measure how far you stood from your tree to get your angle. The angle to my tree was 55 degrees. The clinometer height was 61 inches. The distance to my tree was 172.5 inches. My tree is surrounded by other trees so i must use Method 2. This method uses a little trigonometry. It isn’t hard. First make sure all your measurements are in inches. You will need to find the tangent of your angle. Perhaps you have a calculator that will tell you. Otherwise you must look in a trigonometry table. I used a table. Multiply the tangent of the angle times the distance to your tree. Then add the height to your friend’s hand. The tangent of 55 degrees is 0.7002. I multiplied 172.5” x 0.7002 to get 120.8 inches. I added the 61 inches for a total of 181.8 inches or 15 ft. This entry was posted in Outside Project on August 13, 2014 by [email protected]. Up to now we’ve looked at and listened to things around your tree. All the tree does is provide a back rest while we sit and look around. What about the tree? As you approach your tree, look at it. Is it straight? Does it bend? Why would a tree bend? Is the trunk the same from the ground to the top? Does your tree have two trunks? Does your tree have branches? Do two branches go off at the same time? Do the branches take turns? How do the branches give your tree shape? Do you think the branches on a curved tree will be different than if that tree was straight? Why? Do you think the branches on a side of a tree near another tree will be the same as on a tree all by itself? Why? My tree grows on the edge of a bluff rock about 15 feet above the creek. It curves away from the edge to keep much of its weight over solid ground. It twists around to keep away from other trees and get more sunlight. My tree is very crooked. The trunk twists and turns. The tree isn’t very tall or very old so it grew up under lots of taller trees. This made the tree twist to find places with the most sunlight. 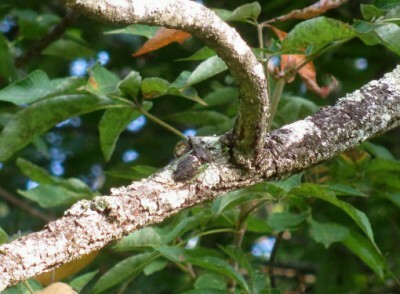 Besides being crooked, the trunk is much fatter at the bottom than near the top of the tree. It gets thinner faster every time a branch goes off. The trunk at the base of my tree swells out. It’s hard to see why from this side. My tree is growing on top of a small rock bluff with very little dirt under it. The base of my tree is big where it goes over the rock. My tree grows on the edge of a bluff. I grabbed the trunk, held out the camera and took this picture. Look how my tree roots flow down over and around the rocks. The branches take turns. One goes off one way. A little ways higher another branch goes off the other way. One branch seems to have become the new trunk near the top of the tree. The bigger branches point away from the bend in the trunk. If my tree’s trunk were straight, I think the branches would be more even. The tree wants as much light as it can find. If the trunk is straight, all the branches would get sunlight. If a tree is growing near another tree, there is less light on the side pointing to the other tree. The branches would be smaller on that side as there is less light. Branches on the other sides would be bigger. There is no real shape to my tree. Instead each branch has a cloud of leaves around it. I think this is because the trunk is so crooked. What Kind of Tree Is Your Tree? The place to start is looking at your tree’s leaves and bark. If your tree is very tall, maybe you can find a leaf on the ground. Leaves can be simple or compound. A simple leaf has a petiole with a leaf blade. A compound leaf has a long center petiole. There are several little leaves called leaflets attached to the main petiole. In my area black walnut trees and various kinds of locust and hickory trees have compound leaves. Leaves line small branches. The leaves are simple as each leaf blade has a petiole and bud to itself. The alternate or take turns on the branches. Look up at a small branch with leaves on it. This will help you see if your leaf is simple or compound. You can also see if the leaves are on the branch in pairs or take turns. My tree has heart shaped leaves with two inch petioles. They are a blue tinted green. Slight grooves show where the leaf veins are. Something has been eating some of this leaf. Is your tree leaf simple or compound? My tree has simple leaves. Look at both sides of the leaf. Are they the same? It’s easy to see the leaf veins on the underside of a leaf. It is lighter green. There are thick parts running in lines. These are leaf veins. Some carry water to the rest of the leaf. Others carry sugars to the trunk and roots. What pattern do the veins make? One vein pattern is a lot like a tree with a main vein going the length of the leaf and lots of branches going off. Another pattern has several big veins going off in different directions from the petiole. My tree leaf has the veins going in many directions from the petiole. Trees have bark on their trunks. It is old dead cells. 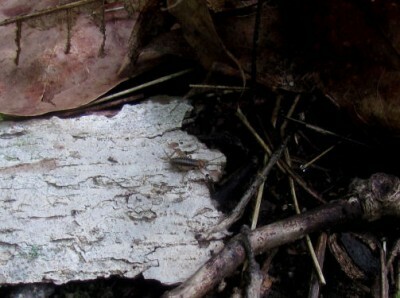 As bark these cells help protect the living cells underneath from being injured, drying out or getting too hot or cold. Deep grooves separate the bark plateaus on my tree’s trunk. The bottom of the grooves looks red. The tops look gray and have mosses and lichens growing on them. Bark has patterns too. Do all tree barks have the same patterns? Look at several different kinds of trees to find out. The top side of the bark piece I pulled off is grayish with green moss and light green lichens growing on it. If you want, you can put a piece of paper against your tree and rub the flat side of a crayon over the paper. Taping the paper in place helps to keep it from moving. This helps show you the bark pattern. My tree has bark tongues overlapping. The top of the pieces is reddish gray. Lichens grow on them. The bottom is reddish brown. The underside of the bark piece I pulled off is very different from the top. It’s reddish brown and smooth. Now it’s time to look in a tree guide. I looked in Missouri Trees from the Missouri Department of Conservation. Most tree guides have pictures or drawings of tree barks and leaves. Trees have flowers too but July is not a good time to see the flowers. Compare your tree’s bark and leaves to the pictures until you find a match. My tree leaf has a heart shape. Two Missouri trees have heart shaped leaves: mulberry and redbud. My tree’s bark doesn’t match a mulberry. My tree is a redbud. What kind of tree is yours? This entry was posted in Outside Project on July 30, 2014 by [email protected]. Outside 4 What Grows There? Insects and other creatures move. That catches the eye. Plants are just there. 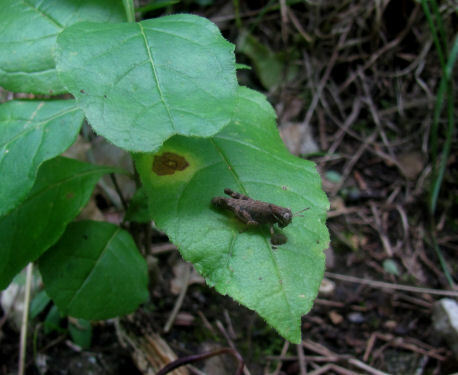 If plants didn’t grow in your spot, there would be no reason for the creatures or insects to stop by. Penny and her two buck kids came by wondering what I was doing. What plants grow in your spot? Limit this to about three feet out from your tree. July is not a good time to identify plants as few of them are in bloom. It’s still easy to see how many kinds are around as different kinds of plants look different. 3) are there any flowers? Hot pink makes these easy flowers to spot. Their small size makes them easy to miss. This is a Deptford Pink. I took my camera out and took pictures of the different plants. Some of the plants I recognized. I know I’ve seen others but when they had flowers. Only one plant was blooming, a Deptford Pink. Two had empty seed heads on them so I know one was a horsemint and the other an Ohio Horsemint. A fern grew on the rocks. There were three kinds of grasses and at least fifteen other plants. Since there were so many, I put in this gallery of pictures. In gardens and lawns this grass is a weed. I was told it was called devil’s grass because it was so hard to dig up. A second kind of grass has short wiry blades. Old ones curl up and turn dry brown under new green ones. A tall grass stem hung over a rock outcrop. 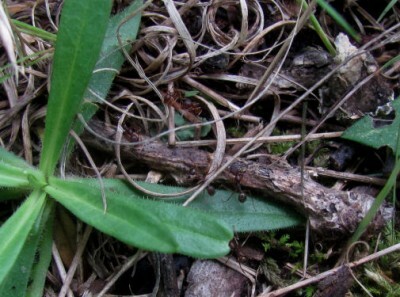 It is a seed stalk from another kind of grass. I think this is a different kind of grass called a sedge. The blades are thicker and coarser than regular grasses. Red cedar isn’t really a cedar but a juniper. This one is trying to grow out of the rock below my tree. It may not look like it but this is a fern. In the early spring the leaves unroll from fiddleheads. The whorled leaves are so pretty. There are five or six kinds of these little plants with tiny four pointed flowers and tiny seeds in twin balls that stick to everything. The genus name is Gallium. I don’t know the regular name. Some people mistake Virginia Creeper for poison ivy. It has four or five leaflets on each leaf instead of the three poison ivy has. One of these wild grape vines grows on a fence in my garden so I recognize the leaves. Ohio Horsemint bloomed a few weeks ago, made seeds and the plants are starting to dry up. The seed head makes it an easy plant to identify. Have you ever looked for four leaf clovers? This yellow wood sorrel has lovely clover leaves but I’ve only found them in threes. It has yellow flowers. I’ve seen this plant growing in the woods. Until I see a flower I don’t know what it is. I think this plant is called horsemint but there are no flowers so I can’t be sure. All the leaves grow out of one place. They form a circular plant in a rosette form. Like the last plant all the leaves come from one place making a rosette. These leaves have a smooth edge. Tiny hairs cover the leaves and stalks of this plant. The leaves on this plant are pretty with their fancy lobes. I think this plant grows down along the creek. I need to see it bloom to be sure. This plant has long arching stalks with tube shaped pink flowers. Maybe in a month this seedling will bloom. This entry was posted in Outside Project on July 23, 2014 by [email protected]. Outside 3 Who Lives There? Does someone live in your chosen spot? When it comes to people, that is an easy question to answer. People generally have a house or apartment or a tent or trailer, something to live in. If you are talking about various animals, it may be hard to tell. Some animals dig burrows. But not all holes are burrows. Some are places where tree roots have rotted away. Perhaps the hole is a burrow but no one lives there anymore. Insects are even harder as many have no real home. Often insects have an area to call home but may stay in a different place every night or day depending on when they are awake. The ground was still damp after a rain but the sun was shining on the hill above my spot. Since many of your spot residents are probably insects, use only a little bug spray to keep them off of you but not chase them away. Have a notebook to write down and sketch what you find. I like to use a camera. Walk quietly to your spot in case any animals are there. Look and listen to what is happening in and around your spot. Write down what you see and hear. I settled into my spot to see who might come by. It was cool with a gentle breeze as rain fell last night. Sunlight came through the trees on the hill. My ears told me about some possible residents. The birds were calling. I’m sure some visit my tree but I see no nests. There are three kinds of cicadas on my Ozark hill although some only appear every few years, 13 and 17 years. This is the 13 year cicada. The one I heard this year is an annual cicada which is bigger and all green but too far up in the trees to get a picture. The cicadas are buzzing. 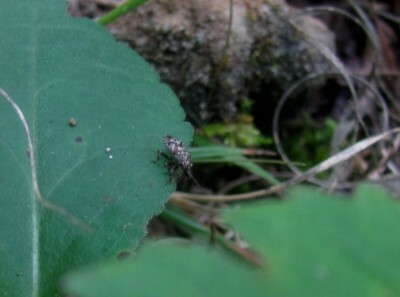 These insects are far up in the oak trees all around my spot. Baby cicadas live in the ground sucking sap from tree roots. Some may live under my tree but I would not see them. I’m not certain what this insect is. At first I thought it was a beetle but its wings cross its back making it a true bug probably a leaf hopper or a frog hopper. A big bullfrog was calling when I first got to my spot. There is a big pond like area in the creek below my spot. The bullfrog sounded like he was nearby but I didn’t see him. 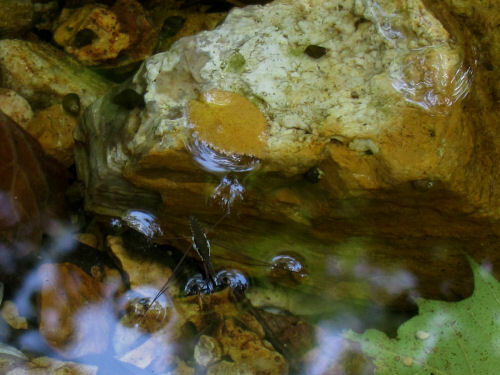 I could see water striders on the creek below my spot. As I left my spot I walked around to the creek to see them striding across the water. Each foot makes a round depression in the water surface making it look like the strider is skating across the water. Today I could hear the creek running over the rocky bed. Looking down I saw some small bluegill fish and minnows. Water striders followed the fish on their patrol around the pond area. Immature grasshoppers hop but have no wings to fly. They have short antennae. None of these live in my spot. Like flies there are lots of kinds of ants. These are bigger black ants searching for food. Around where I was sitting the plants looked green and moist from the rain. A small grasshopper was sitting on a leaf. Ants ran by looking for anything they would consider food. A small cricket ran over a piece of bark then hid under some old fallen leaves. Crickets and grasshoppers are similar. This is definitely a cricket, an immature field cricket. Its body is flat and oval. It has long antennae. It prefers crawling to leaping and flying. 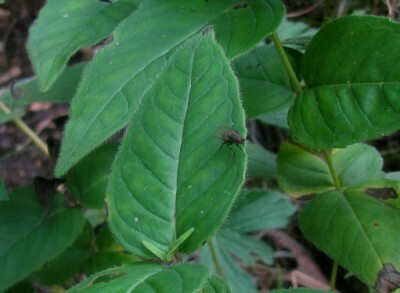 A fly rested a minute on a leaf. Other insects flew by. Some sounded like flies. One was a beetle, maybe a firefly as it had hard wings sticking out with its body hanging down underneath. There are so many kinds of flies. This one is small with lots of hairs or bristles. The grasshopper moved to another leaf and began eating. It didn’t eat the edge of the leaf but cut a hole in the middle. The little grasshopper decided to ignore me and get a meal. Notice where its hole in the leaf is. It was lunch time according to my stomach so I left the grasshopper to enjoy its meal while I went to get my own. This entry was posted in Outside Project on July 16, 2014 by [email protected]. Now that we have our spots picked out, it’s time to learn something about them. This week’s challenge is one that sounds easy. You will be listening. A little bug repellent doesn’t hurt. I skipped it and had a couple of persistent pests. Try to stay in your spot for fifteen minutes. A watch or a timer is handy. Do let someone know where you will be if you are off in the woods. Take your nature journal or a notebook with you. Go out to your spot. Turn off your phone. No listening to music. Getting ready for this project on listening, I found a flat spot in front of my tree, sat down with my back against the tree and looked along the edge of the cliff over the creek. Sit down and get comfortable in the shade. I sat on the ground with my back against my tree. Close your eyes and listen for fifteen minutes. What do you hear? I heard the wind. It would start behind me making a rushing sound up in the trees. The air around me was still. The rushing sound rolled through the trees over my head. Wind swirled around me. I enjoyed it as the day was very warm. The wind gusts started in the tree tops but soon blew the grass over too. When one wind gust blew by, I could hear another one starting. Each time the rushing sound came up through the trees until it went overhead. Then the breeze would blow over the ground. A couple of vehicles went by on the road across the pasture. One was a truck because it was so loud. I could hear an empty trailer bouncing behind it. The other one wasn’t as loud and might have been a car. Across the creek my goats were in the shade keeping cool. When they saw me, they got up to graze. The wind blew ripples into the water in the creek. The goats were across the creek from my spot. I could hear them snorting now and then. They rustled dry leaves as they walked up the creek then came back. A bird started singing in a nearby tree. Another answered it from farther away. The one farther away sang off and on the entire time I was listening. A different bird squawked at me. It was an alarm call. I moved and it flew off. Then a fly came by. It buzzed by my left ear. It moved to the right ear. I waved a hand at it. It buzzed behind me. I waved a hand at it again and it flew off. More troublesome was a small native bee often called a sweat bee. These land on you to eat the minerals in your sweat. This one was all black. Its pollen carriers on its back legs were full. The problem with these sweat bees is that they have a short temper. If they get brushed or feel trapped, they sting. I usually get stung. I blew it off the back of my hand. For the rest of the fifteen minutes, this bee kept landing on my hand or arm. I would feel it land, open my eyes and blow it off. I am surprised I didn’t hear more insects. Perhaps this was because I didn’t go out until mid afternoon on a hot summer day. And the wind was blowing in gusts the entire time. Some wind gusts blew with a low roar up through the trees over the hill and never touched the ground. Between wind gusts everything was quiet. Not even the creek seemed to make any noise. I think I heard some fish on the surface. There was a rippling sound in the water then a plop. Perhaps the fish were catching insects. This week my mind didn’t wander so much. I didn’t try to go to sleep with my eyes closed in the warm air. But then I did keep opening my eyes to chase that bee. How did you do? What did you hear? This entry was posted in Outside Project on July 9, 2014 by [email protected]. Summer is vacation time. Summer is time to be outside. This Outside Project is for being outside. It is a challenge for you to set aside other activities and look around you for a time each week. There is one essential thing needed to do this Outside Project: a spot. This is a place with a tree for shade, room to sit on the ground or a stool. It can be in your backyard, in a park or even a place wherever you are on vacation. Perched on a big rock overhanging a creek, my spot isn’t very big. I found my spot on the side of a hill over a creek. It has a tree I can sit under and lean against. Behind me as i sit there is a drop off to the creek. There is a wide place like a pool there. I can see the stony creek bed. Looking down I can see the creek. It’s shallow and shaded by trees on the banks. Around me are some rock outcrops. There are ferns and other plants growing on and under these rocks. In front of me I can look up the hill. Trees are scattered on the hillside. The ground is gravelly but lots of plants grow there. Looking up the hill I can see another rock ledge and scattered trees. What is the challenge? Turning off the cell or smartphone. Not texting. Not talking to a friend you bring with you. A large rock sticks up a short way in front of my tree. It has lots of fissures where plants grow. Sit down and look around you. Listen to the sounds around you. Don’t think this is much of a challenge? Picking out my spot, I tried to sit down and relax for a few minutes. My mind kept thinking of doing things and going somewhere else. Focusing on this lovely spot was a challenge. Lots of plants grow in front of my tree. Are you up to the challenge? Find your spot and sit down for a few minutes. Next week we will seriously tackle this challenge. You may want a timer. This entry was posted in Outside Project on July 2, 2014 by [email protected]. I rarely go out at night to walk around, especially over the summer. This isn’t because the weather isn’t nice or the calling owls aren’t interesting or the night blooming flowers aren’t lovely. It’s because of the snakes. This little piece of the Ozarks had the nickname Copperhead Gulch when we moved here. The copperheads still live here. Even with a flashlight they are hard to see. Four to six foot black snakes come out after dark. I know they are around because I see them from time to time, usually eating eggs in the hen house. How they have room for eggs considering the mouse population under the barn floor is beyond me. Maybe eggs are dessert. I do find seeing snakes interesting. Water snakes are at the creek. Ringnecks are under boards or other items left over from various projects when clean up starts. Garter snakes zip away in the garden from time to time. The road is another place to spot snakes. One day a Midland Brown Snake was crossing as I went out to milk. Another day a Rough Green was sunning at the edge of the road. A Speckled King was peeking out another morning. So I know many snakes call the place home too. I found another proof – a snake skin. Our skin stretches as we grow to accommodate our larger size. Snakes are covered with scales. Scales do not grow or stretch. When a snake grows too large for the present scale covering, it must discard the old one and replace it with a new larger set of scales. Since a snake has no hands or arms to remove the old skin, it must find another aid. This black rat snake found a couple of giant ragweeds that had regrown after being chopped. When I found the skin, half of it was in a little ball with the tail sticking out across the grass. The snake had caught the mouth part on the ragweeds then slithered through as the skin bunched up pulling free of the new scales. Finally some of it stuck and got carried through but it too was left behind. I carefully pulled the skin bundle loose. The skin is an easy four feet long. It is inside out. It shows the outline of every scale. The guidebook for Amphibians and Reptiles (by Tom Johnson, Missouri Department of Conservation) says black snakes have double scales below the vent. Looking over the snake skin, I can see this. Forget picking up a wild four foot black snake to look! Definitely snakes live here too. Over the summer they go roaming at night. It is now dark when I come in from evening milking. Maybe I will put fresh batteries in my flashlight. Beware all you hay fever sufferers: the ragweed is in bloom. Two kinds grow along the roads and anyplace else they can around here. Both are now in bloom. The common ragweed is a lacy looking plant. Its leaves have many deep lobes leaving thin fingers of leaf. The plants get about five feet tall in a good location. Giant ragweed is different. It has a thick central stalk that can get two inches in diameter. It is tough and strong. The leaves have three lobes of wide leaf sections. The plant can reach eight feet in a good location. Both plants put up numerous columns lined with pollen bearing pockets. Since ragweed is wind pollinated these are big pockets. The pollen is small and light. Bump into a ragweed in bloom and clouds of yellow pollen burst out. The yellow cloud hangs in the air waiting. It is waiting for a breeze, even a slight one to come by and waft it over to another ragweed plant. Unfortunately that cloud hanging there waiting also snares the nose of anyone walking by. Some plants just beg for war. Ragweed is one. One line of defense is to pull these ragweed plants up. I do in my garden and around the yard. This only works when the soil is moist and the plants are small. The second line of defense is to chop the plants down. Ragweed is stubborn. It sends up new stalks from the stub of the old one. These things will bloom when only six inches high! These are just stop gap measures. Ragweed is prolific. There are so many plants it is impossible to get to all of them. The pollen blows long distances. Ragweed is winning the war. Tissue sales will rise. Allergy medicine sales will rise. Sneezing, runny noses, itchy eyes will proliferate from now until frost finally puts an end to the reign of the ragweed. After over nine inches of rain in the last week, everything is soggy. The creek flooded in August, something we don’t remember in twenty years here. That makes it a great year for jelly mushrooms. Until moving to the Ozarks, I was unaware jelly mushrooms existed. A mushroom was a round flat cap smooth on top and gilled underneath sitting on a stalk. Those caps come in many variations and colors. Some are smooth. Some have patches on skin on them. Some look like frilly shingled layers. Some are so translucent the gills underneath show through the cap. There are flat caps, cupped caps, thick caps, thin caps. One cap reminds me of a Mexican sombrero. Jelly mushrooms are totally different. These odd mushrooms do come in a variety of colors. But the colors are translucent like Jell-O contained in a tough membrane. Rain brings out the jelly mushrooms. Like Jell-O, these mushrooms are mostly water and dry out quickly. The common brown one is often called an ear mushroom as it often has an ear shape. It pokes out of old stumps or chunks of wood usually oak. Another is white. It looks like a shelf mushroom run amok. The curtains vary from almost clear to opaque white. A chunk of oak log left over by the sawmill has bright yellow jelly drapes sticking out. These are much smaller than the other two. Some bits are round with smooth edges. Other pieces have deep lobes looking like thick fringe sticking up. Blobs of jelly mushrooms can stick out anywhere on old wood. One pushed out of the end of a fallen branch. Others are on the smooth surfaces of oak lumber. They can be on other woods but oak is the most common here. Most jelly mushrooms are small, just an inch or two tall. A few form bigger masses. The brown ear mushroom is supposed to be edible. One use is in Chinese hot and sour soup. It may have medicinal use. I’m not too sure I want to try ear mushroom yet. It looks so very strange. That translucent brown Jell-O encased in a tough membrane with a white sheen in the sun just doesn’t look appetizing to me. At least no other mushroom looks even remotely like it. That alone is reason to stop and take a look when it puffs out of a piece of wood after one of the frequent rains this year. Late summer is aster time. Lots of flowers are blooming but members of the aster family put on the most noticeable display. Hold it. Asters look like daisies. Thistles definitely don’t look like daisies. Not all members of the aster family look like daisies. What all of them have are masses of tube flowers. Look carefully at a thistle. That pink mop is a mass of tube flowers with long stamens hanging out. Thistles are a popular hangout for lots of creatures. The blooms are popular with insects. Each tube flower is a tiny well full of nectar. The native tall thistle gets eaten by goats and probably deer about the time it starts to bloom. More than once I’ve watched for a thistle to bloom only to find the top gone just before the flowers opened. Thistles are a great place to take butterfly pictures. Pipevine and other swallowtails flutter around them. The butterfly stands on the flowers slurping up nectar. Its bottom wings are still. The top ones flutter as though making more stomach room for more nectar to fit in. Skippers are another group of butterflies that like thistles. They get so busy drinking nectar I can sneak up close for photographs. Along with the nectar lovers, predators move in. Flower spiders blend into the tube flowers with their front legs spread wide to grasp an unlucky fly or bee. Ambush bugs hang onto the sides of the tube flower mass waiting for dinner to arrive. Once the seeds form, birds like goldfinches move in. Loaded with fat and protein thistle seeds are some of the best bird seeds around. Goldfinches and their babies get fat on them. There are invasive non native thistles growing in the area. These are nuisances at best and major pasture invaders at worst. Native thistles belong here and are valuable members of the Ozarks. Now is the time to admire these members of the aster family. This entry was posted in Outside Project on September 11, 2013 by [email protected].